Cannabis concentrates (achieved through cannabis extraction) are among the most popular cannabis products on the market today, particularly with the younger demographic of consumers like millennials and Generation Z. This robust segment of cannabis-product lines commonly found in dispensaries include a number of specific products that are created using a variety of methods. To learn more about cannabis extraction, as well as the various methods used to create cannabis concentrates, let’s divide them into two groups: those created with cold methods of cannabis extraction and those made with hear. Potent concentrates can be made in a variety of ways, and often the names given to these products relate to their consistency and appearance. The following products are commonly found in the cannabis market today. If a cannabis consumer is familiar with only one extract, most likely it’s hashish (aka hash). Commonly created and smuggled from countries like Pakistan, Afghanistan, and Turkey during the 1970s and 1980s, this variety of hash came from potent indica plants in their countries of origin. Depending on the method of creation as well as storage, this hash usually came in three colors: black, red, and blonde. The oldest method of creating this hash is referred to as “finger hash” and was made by cannabis cultivators who ran their hands over the surface of the plants’ flowers and rolling the gobs of THC-rich trichomes from their hands’ surface into balls that were later smoked. Although this is a cold method of cannabis extraction, it differs greatly from the most common method of creating hash in the United States today. 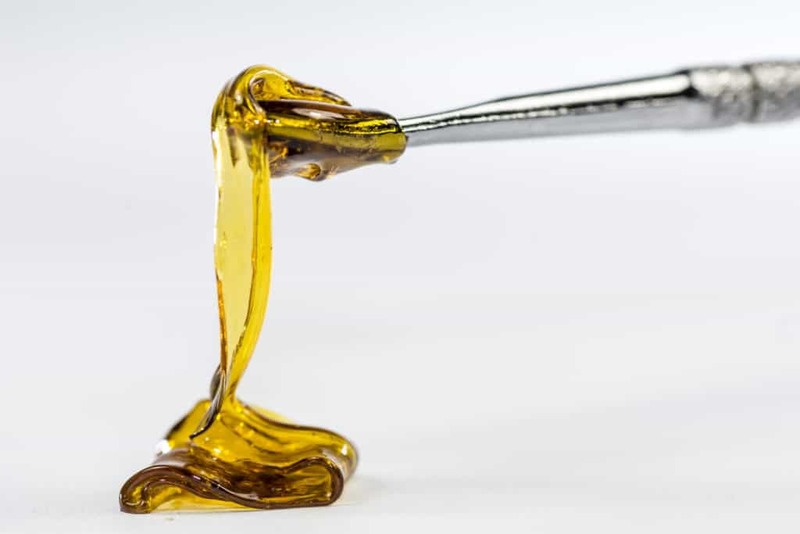 Other concentrates that are made through the use of one of a variety of solvents include wax (which has the consistency of candle wax), shatter (which usually is a golden color and brittle—like the consistency of peanut brittle), hash oil (which has the appearance of amber oil), crumble (which appears like golden cookie crumbs), taffy (which is golden and the consistency of saltwater taffy), kief (which appears similar to a powder but consists of the THC-rich trichomes that fall from the surface of cannabis flowers), and rosin, which has a similar appearance and consistency as hash but is created with a hot cannabis extraction method. Cannabis edibles, topicals, and teas are also forms of concentrates or are made with them as a major ingredient. Cannabis cooking oils and butters also contain rich amount of concentrated tetrahydrocannabinol (THC). Regardless of the method used to create these cannabis extracts, all of them contain concentrated amounts of (THC), so the experience when consuming them is powerful. Most concentrates are consumed by either smoking them or using a vaporizer device like a vape pen for cannabis oil or a dab rig for wax, shatter, crumble, oil, and taffy. Hash and rosin are generally smoked or used as a “bowl topper” on ground hemp flower in a pipe or bong. They also are sometimes consumed in a joint or blunt mixed with ground flower. Cold cannabis extraction methods result in the creation of concentrates like hash, kief, wax, shatter, crumble, and taffy. We will discuss how to create kief and hash at home later in this article, but the other concentrates like hash oil, wax, shatter, crumble, and taffy is made with the use of a variety of volatile solvent substances like ethanol, butane and propane. While people sometimes make these types of extracts at home, the process is potentially risky and dangerous. On the commercial level, they are usually created at designated MIP (marijuana-infused products) facilities that are equipped with elaborate and extremely expensive machinery that was created specifically for their intended purpose. While some impressive concentrates are made this way, we will touch on them in passing and not go into the specific of creating them to avoid tempting someone from trying to duplicate the process at home, with disastrous consequences. It’s best to leave these extracts to the pros and their elaborate equipment. Fortunately, there are high-quality extracts you can make at home without any danger, and they are quite good. We will describe how to make both a hot and cold concentrate below. Cannabis concentrates created with the use of heat include teas, tinctures, oil or butter for edibles, rosin, and topicals like salves, creams, and lotions. These types of extracts require the decarboxylation of raw (either cured or uncured) cannabis flower. Decarboxylation activates the THC in cannabis and allows people to get the desired effect when consuming it. Tinctures, a form of edible usually consumed by the drop, is a concentrate created with heat, cannabis, and alcohol. Tinctures are usually placed on or beneath the tongue. Usually a drop or two is all that’s necessary for effects to be felt iif it’s a THC-based tincture. CBD tinctures also exist. Cooking oils and butters (cannabutter) are easily made by heating cannabis flower in either oil or butter to extract the THC and use it later either for cooking or baking. Creating rosin is another common method of hot cannabis extraction. Making rosin at home is relatively easy. Use thick gloves to avoid getting burned by the hot surfaces necessary to make it. Rosin is a great concentrate that’s similar to hash. Simply assemble some high-quality cured marijuana flower, a hot press like an iron (sans water) hot plates (a hydraulic hot press with thermostat is perfect), or hair straighten, and two pieces of parchment paper. Place the cured flower between the parchment paper so it’s easily contained within the paper—don’t overfull. Then, set the temperature of the hot press to between 300-345 degrees Fahrenheit (start at a low temperature and then go higher if necessary). The final step is pressing the flower encased in parchment paper for between 5 and 30 seconds under moderate pressure. Start with lower temperatures and time duration, then increase as needed. Once pressed, evaluate the rosin between the parchment paper. Lower temperatures result in firmer rosin and higher temperatures result in rosin with a sappier consistency. All that’s left after that is enjoying your rosin. You will likely need a dab tool to collect it from the parchment paper for use or storage. Making bubble hash is a cold cannabis extraction method. To make this hash, a bucket or large vessel containing the series of collection bags fits snuggly like a trash bag within a trash can filled with ice water. Then, the flower—either dried or fresh—is put in the ice water (some people choose to freeze the flower prior to placing it in the ice water). Once allowed to sit for an hour or so, the water is agitated with a heavy spoon or paddle (some people use an electric cake mixer, using extreme caution not to let it get it fully emerged in water, for obvious reasons). The water is mixed and agitated fully before being allowed to settle once again. This process allows the trichomes on the flowers to become nearly frozen, which causes them to fall off the flower and collect at the bottom of the bag. When removing the first couple of bags, the plant material is strained out. The remaining bags include trichomes and residue that is collected and dried, resulting in hash of varying purity depending on which bag it came from. Cannabis concentrates provide a powerful cannabis experience. There are a wide variety of concentrates, and each has its following of loyal devotees. Some concentrates are best left to expert with professional extraction equipment, while others can be made safely at home. Consider trying cannabis extraction when you require powerful marijuana medicine or a profound recreational experience.